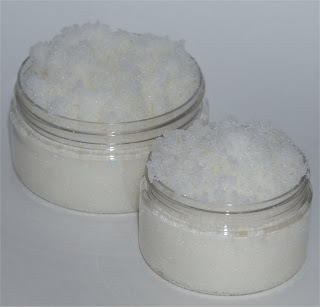 I love sugar scrubs and enjoy a good salt scrub. This scrub is the perfect mix of both! 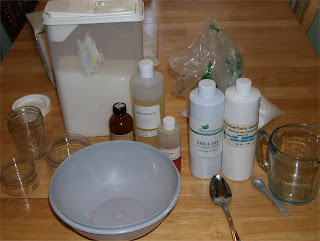 One recipe that I found a few years ago is from Ponte Verda Soaps and I still use it today. It is easy to make, leaves your skin so clean and simple enough to swap oils. I base my recipe off of this one (from PVS) and have never been disappointed. I love it because the ingredients do not settle out and leave all the oil at the top that needs to be mixed in. Eew! Today, I used a mix of Shea Butter Oil, Sweet Almond Oil and a bit of Meadowfoam Oil. 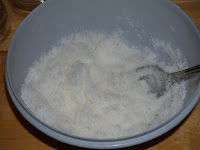 All the ingredients are mixed and are now ready to be placed in a jar, very simple and easy! The fragrance oil was Grapefruit Lily from Bramble Berry and it is one of my all time favorites. It is the perfect mix of floral and grapefruit, so uplifting and refreshing. Ahh! I was going to use a citrus fragrance for Nate’s but he decided at the very last minute he wanted a clean scent. I decided to use Soapy Clean also from Bramble Berry, what a great clean fragrance. This is the recipe from Ponte Verda Soap if you are interested. The final product above, ready to be put to good use! ** Just remember that your tub might be slippery after your shower.